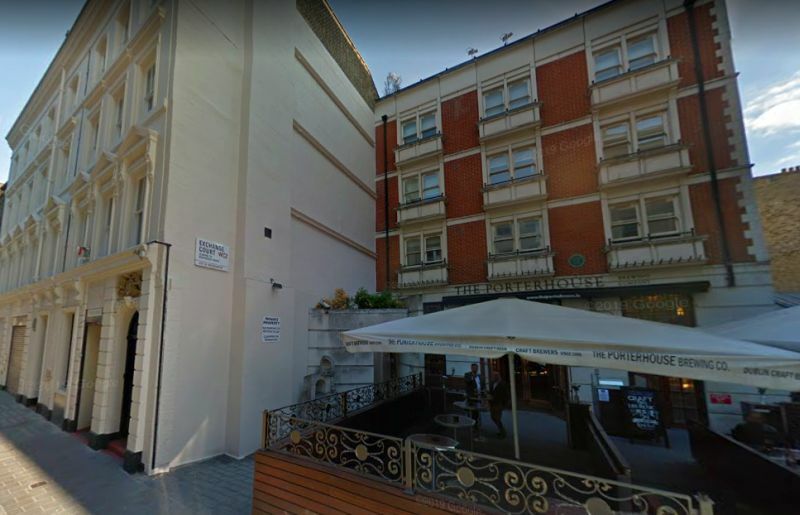 Above - A Google StreetView Image of the site of the former Rehearsal Theatre, Maiden Lane, London, today a Porterhouse Public House. The Stage Door of the Adelphi Theatre can be seen to the left of the image - Click to Interact. The Rehearsal Theatre was situated on Maiden Lane and was in operation between 1908 and 1920. The Theatre was first opened by J. Herbert Jay in April 1908 with a juvenile production of 'Oliver Twist'. 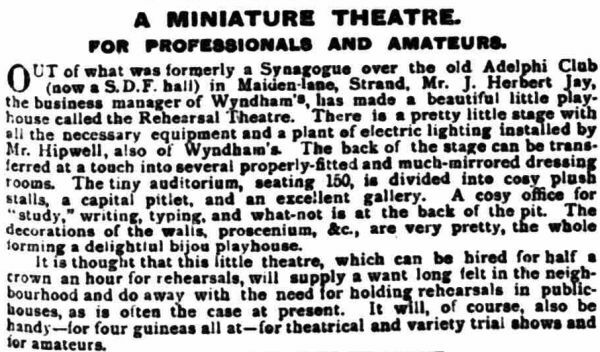 Right - A Notice in 'The Referee' of the 26th of April 1908 describing the new Rehearsal Theatre, Maiden Lane, London. The Theatre was situated next door to the Stage Door of the Adelphi Theatre and was a conversion from a former Jewish Synagogue situated above the Adelphi Club on Maiden Lane, today the site of the Porterhouse Public House, shown above. Above - The Auditorium of the Rehearsal Theatre, Maiden Lane - From 'The Tatler', 20th May 1908. The Theatre had a stage 24 feet wide by 18 feet deep with a proscenium opening of 18 feet, and an auditorium on two levels, lighted and heated by electricity. It had a seating capacity of 160. Its original Manager was J. Herbert Jay, the then Business Manager of Wyndham's Theatre, and was designed to be a place for rehearsals and try-outs of small theatrical productions. 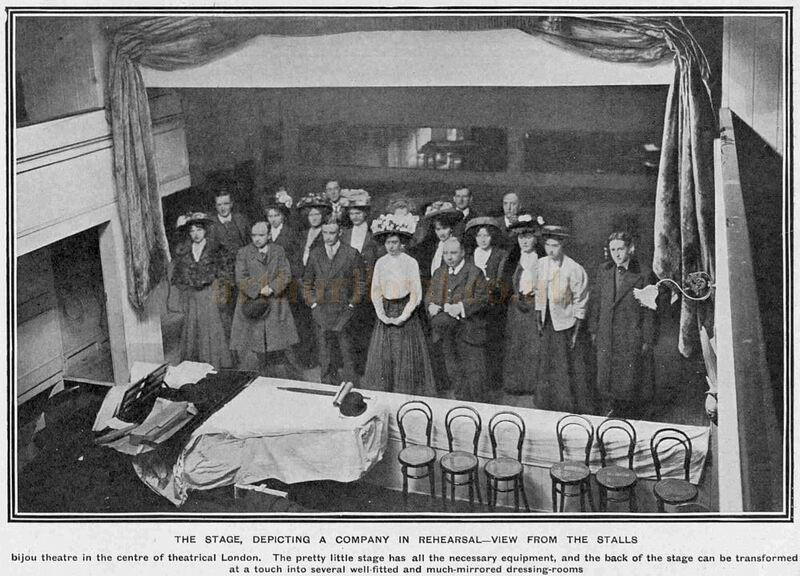 Above - The Stage of the Rehearsal Theatre, Maiden Lane, with a Company in rehearsal - From 'The Tatler', 20th May 1908. 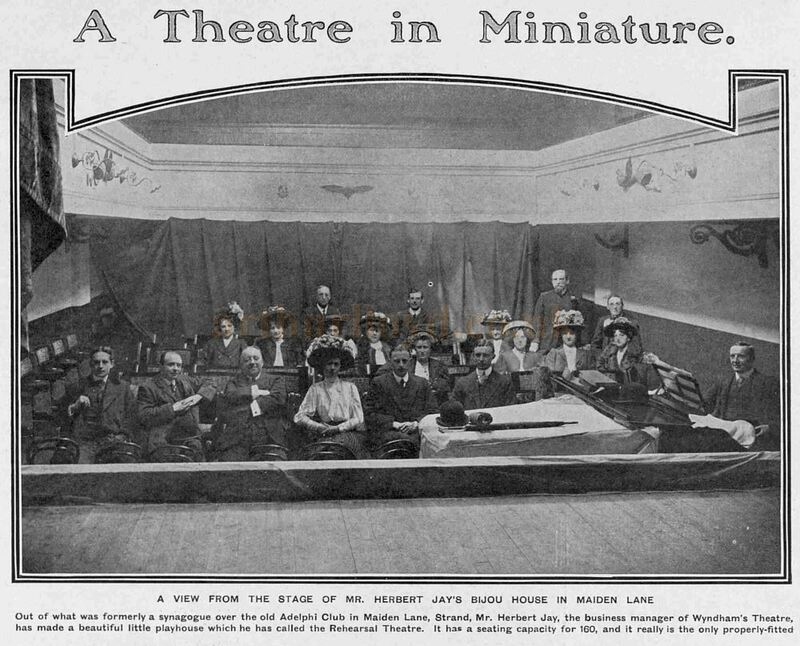 The Rehearsal Theatre had quite a short life, finally closing in 1920. The site today is in use as a Porterhouse Public House. A Poster for Gwladys Dillon's dancing children at the Rehearsal Theatre can be seen at the V&A's Website here.